Peanut has most definitely been more awake lately and I have been trying to find ways to keep her entertained (which isn't easy when she cant even hold her own head up lol!). So when the lovely people at Fisher Price offered us a Rainforest Friends Bouncer for peanut to try we jumped at the chance. The chair has a unisex design and features a variety of animals including a lion, giraffe and zebra along with a variety of other animals. 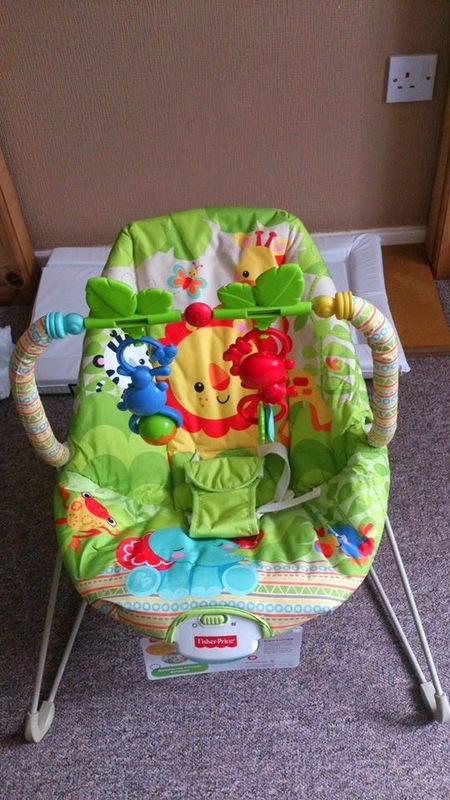 The chair has a removable toy bar which features to monkeys with beads and a roller ball attached (also removable separately from the bar). The chair also has a button which can be switched o to send calming vibrations through the chair. I loved the design of the chair it was lovely and bright and definitely unisex! The vibration setting was a big hit with peanut who often will only really settle when being rocked gently in either mine or hubby's arms so this was a life saver to give our arms a break lol! The chair back has a slight incline so baby isn't led flat which is great as peanut is starting to be more awake and likes to have a bit of a nosy round. 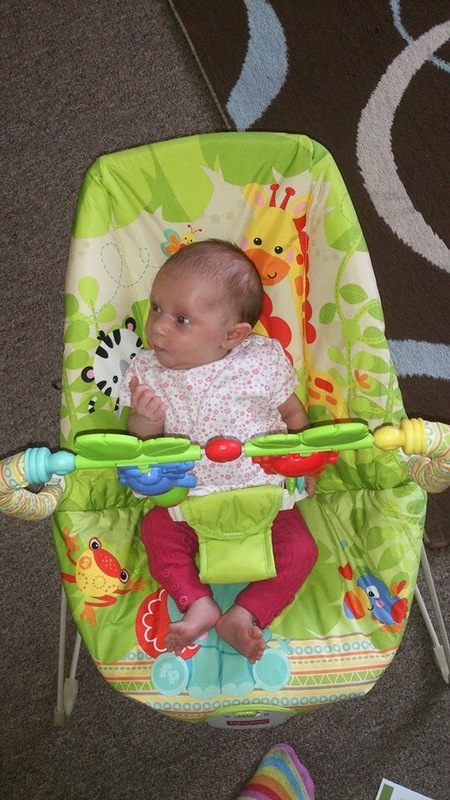 The chair is suitable for 0-11kg (birth-24lbs) and the whole seat cover is removable and machine washable which is fantastic and really useful as we all know babies like to pick their moments when they projectile vomit there latest bottle lol! 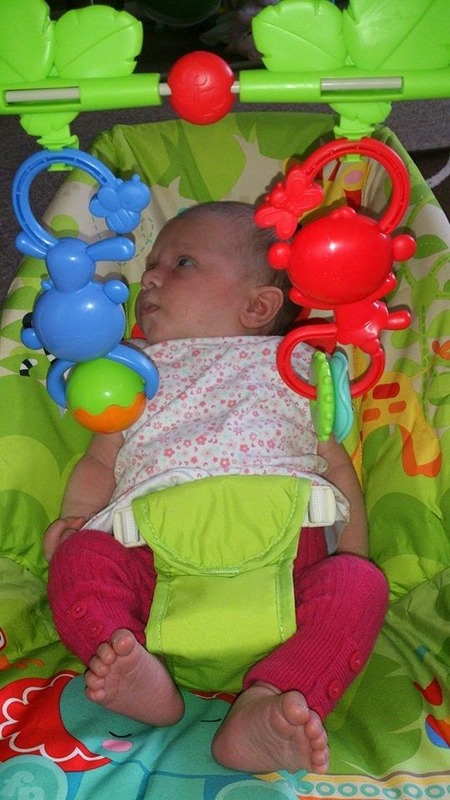 The Rainforest friends bouncer is priced at around £34.99 which I think is a fab price for something so sturdy and useful. The chair has been a big hit with peanut who really enjoys spending time in the bouncer. 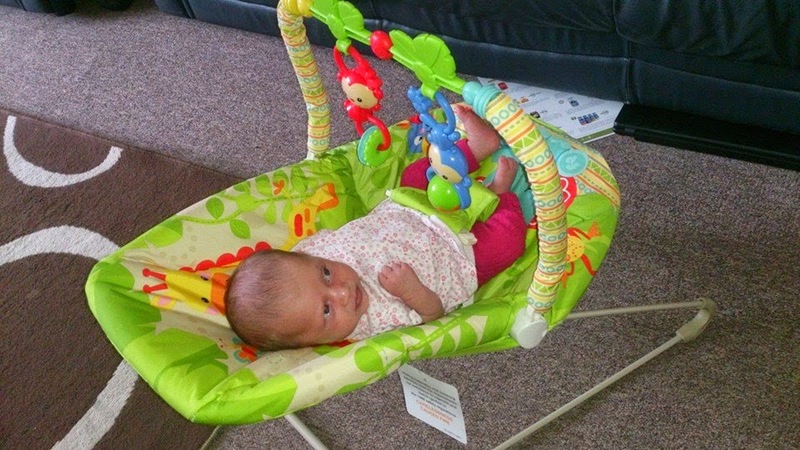 I love the design and would really recommend this bouncer to anyone thinking of getting one for their little ones. 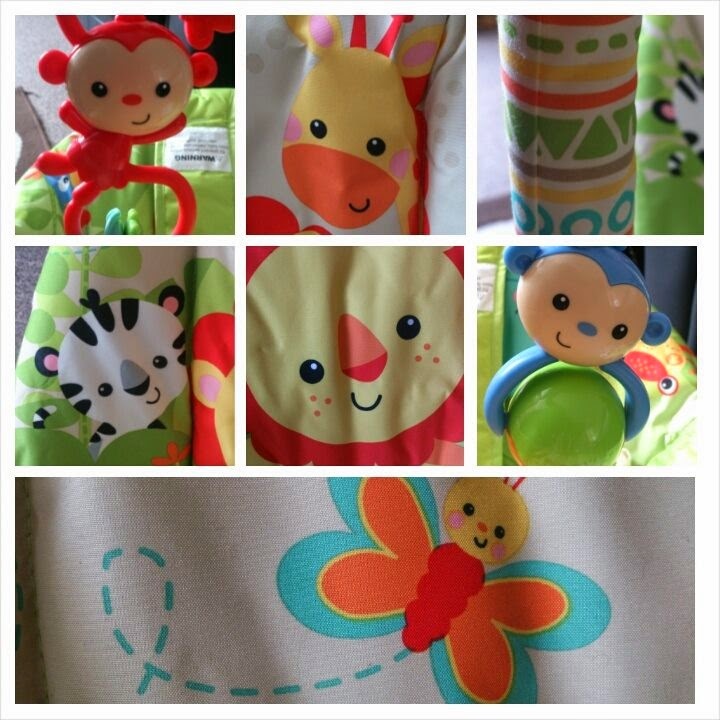 You can check out more from Fisher Price here..
Or purchase your very own Rainforest friends bouncer here ..
That is one very cute chair and I love the colours. She looks so cute in it. Mine never took to bouncers, but loved swings. Your bouncer looks great. 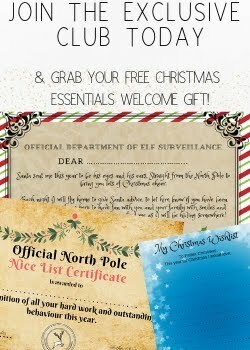 I always found them very useful and soothing for my little ones. That looks lovely, those type of chairs were a Godsend with the twins! looks like a great chair! 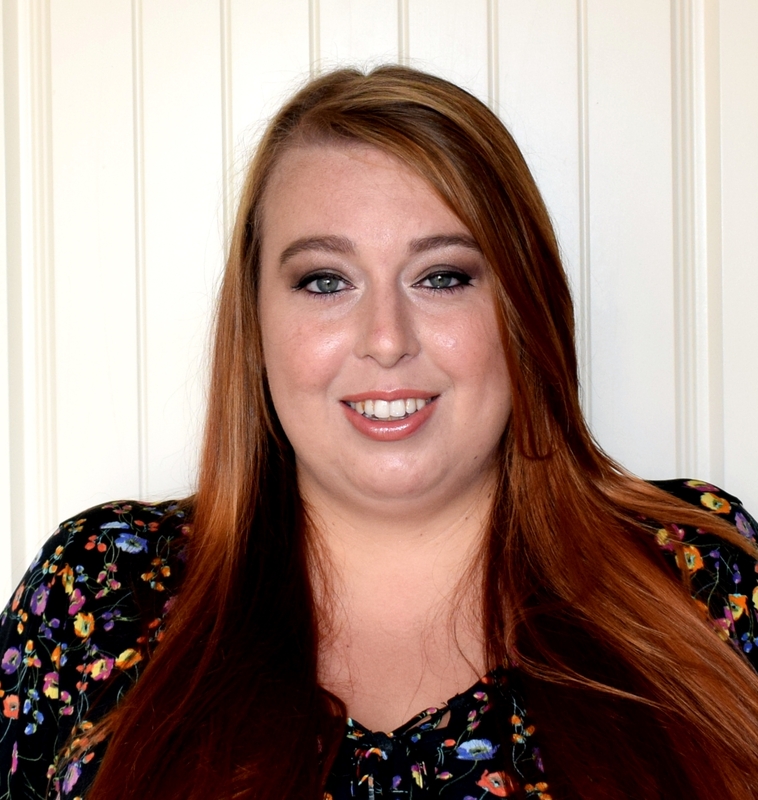 I'm on the lookout for a bouncer for baby number four! Bouncers are a real godsend when they are that little, such a little cutie! i had this bouncy too and my girls loved it:D the colours and design are lovely! That looks lovely! I had a bouncer with my youngest....didn't use it much in the end!! I love all the colours, it looks perfect for a curious baby with the bright toys to look at and bat away! Peanut is gorgeous and the chair looks really useful. We had one of these when our three were babies, and they were so handy. We had the Fisher-Price rainforest baby gym. We all loved it! I think that the bouncers are super and our daughter loved hers - I think it was a Fisher Price one too. That's a really good price - I love bouncers, they help out so much!